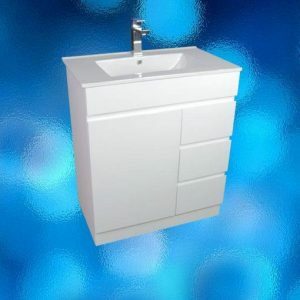 Cabinet white gloss with kicker 2 door 2 middle drawers to suit PE1200 DOUBLE BOWLS. 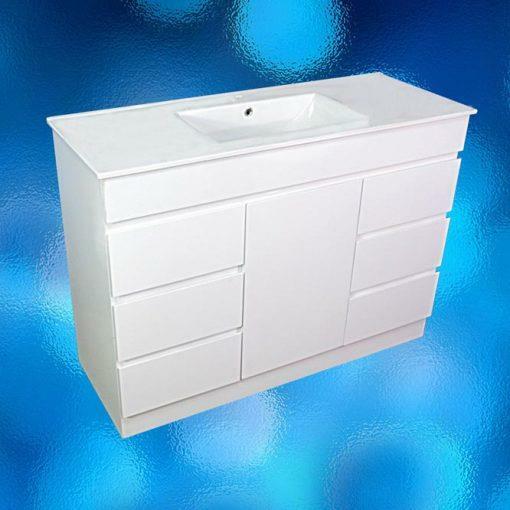 Manufactured to Australian standards 18mm MDF boards cabinets with top quality , white, glossy polypainted surface and kickboards .All doors have soft, self closing hinges and drawers that glide open . This chic, linear, modern Italian design is inspired by the world of art. Elegantly and artistically shaped gloss polypainted doors and drawers without handles give a nice and clean look. Below the sink, there is a lot of storage provided by drawers and full cabinet length doors, giving you enough space for all your essentials, concealed out of sight. Beyond the fashionable looks, this functional bathroom vanity has a lot of countertop space. 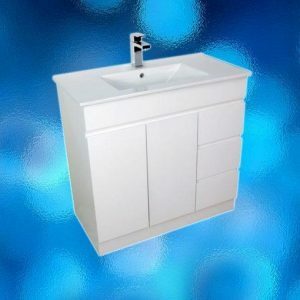 A one-piece, top quality, strong and durable white gloss polymarble sink has TWO bowls with single mixer tap holes . The sink combined with countertop and provide easy cleaning with artistic and classical design.